SKU: 2.0hp Inverter & Motor package with Remote.. Category: Inverter & Motor Packages. Tag: . 2 reviews for 2.0hp Inverter & Motor package with Remote. I was very impressed with the service I received from Newton Tesla . In particular George Newton took considerable time and trouble in explaining how the Mitsubishi AC drive system operated and worked out the connection details for my Colchester Student Lathe. Fitting was straightforward and once I had mastered the programming unit the system worked right first time. It was very good value for money. 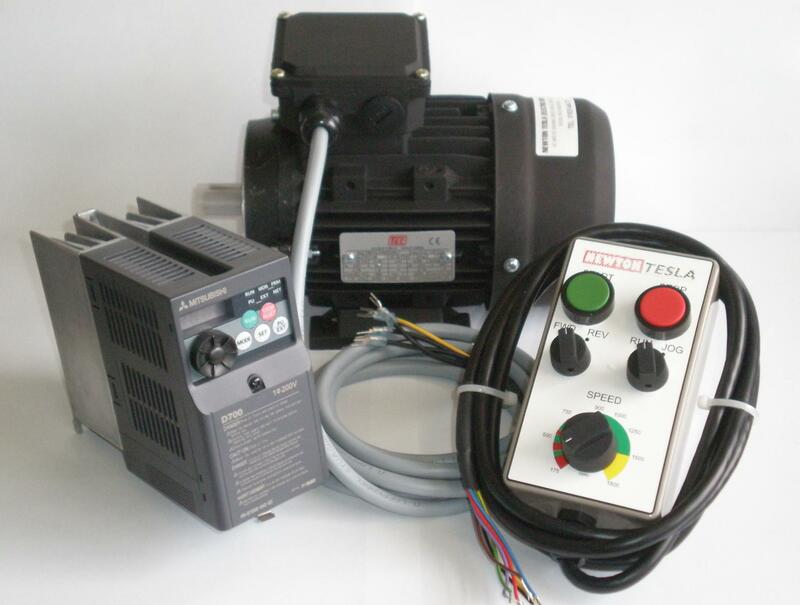 Let me say first of all that I was delighted with the quality of the package of motor, inverter and control box, which were very well packed and delivered exactly on time. I was also very impressed to find that I needed nothing other than the contents of your package to complete the job. Installation of the motor was very straightforward and required no modification to the lathe or the pulley system. Everything lined up perfectly however. I was so confident that I completed re-assembly before testing the installation. It worked perfectly. Smooth and quiet. I love the soft start/stop (no more dimming the house lights when I start it up) and the ability to vary speed while turning, especially parting off, is an absolute revelation. Once again, thank you very much for your help and advice. I shall write something similar and send it to Model Engineer’s workshop. And if you have a potential customer unsure whether to proceed I would be happy to talk to them.